Forget the corny mantra about home being "where the heart is." Home is where you get to kick off your sneakers and bury your hot, smelly toes into a cool, plush carpet after a long day at work. It's where most people feel comfortable undoing the top button of their pants after a filling dinner. It's where tight pencil skirts are swapped for yoga pants, and collared shirts for holey T-shirts. Home is where people shed their daily façades. No one knows more about presenting a performance to the world than artists. Sharing their passions often means putting on some kind of show. But who are these people when they're not in the spotlight? We visited the homes of three creatives — a musician, an actor and a dancer — to get a glimpse at the personalities they reserve for their respective living rooms. 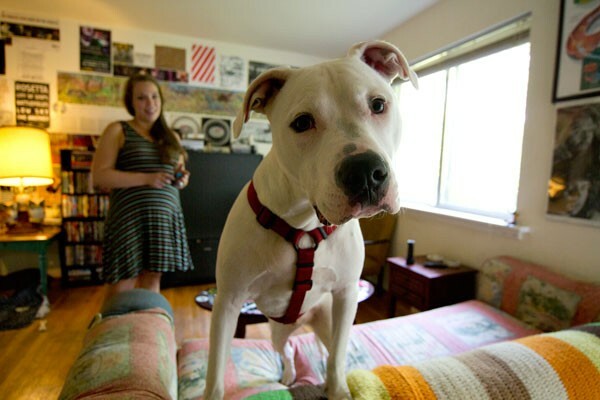 Erica Cice's passion for music is evident as soon as you walk into the living room of the 1,300-square-foot house in NoDa she rents with her boyfriend, Chris. A piano directly across from the front door immediately captures your attention; it begs you to play a few keys, no matter how musically disinclined you may be. But Cice is a lover of music — and talented enough to have earned a spot in the Charlotte Symphony Orchestra on her first audition out of college. 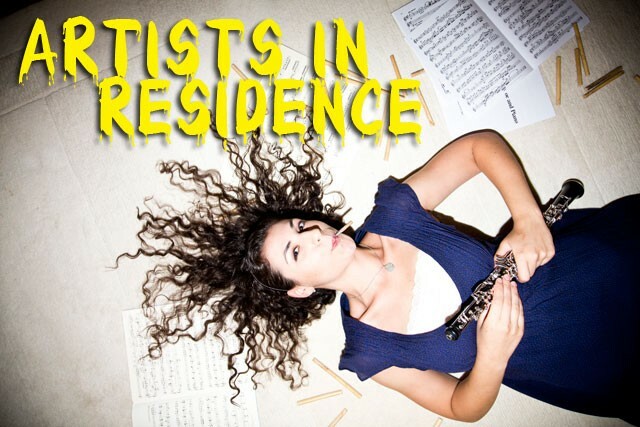 The piano may be her front room's centerpiece, but it's actually the oboe that is the focus of her career. The 28-year-old just finished her seventh season with the CSO. "The difference between the oboe and the piano is the piano is such a solitary instrument, and to be a concert pianist, you're dedicating your life to being alone a lot," she says. "I love the piano. But when I picked the oboe in 4th grade, I was like, 'Cool. I get to play this with friends.' I get to play with people. Even though I'm still practicing on my own, I still get to perform with them." As we walk down the long hallway, what Cice reveals to me as her "naughty pride and joy" says more about her personality than anything else in her home. She grabs a gold-plated trophy, similar to the sports awards you might have won in middle school, and holds it up for me to see. "Me and my partner in crime, she also plays in the symphony, we're both faculty at this music camp in Pennsylvania. And the faculty likes to have a good time, just like the students do, and just like the jokes about orchestra and band camp," she explains. "They have this faculty beer pong tournament. Of course, I'm horrible at that, but they had the costume competition, and we won." Their costume? "We were a deer in headlights. I was the deer, and she was the car with headlights." Cice laughs. "Appropriately placed headlights." Cice turns somewhat serious again when we enter her office, painted a springtime yellow. Scattered on her desk are all the tools — they resemble "medieval torture devices," she says with a laugh — she uses to cut and shape bamboo into the double reeds that will make her woodwind instrument sing. "The running joke if you're an oboe player is, 'I would be so good if I had time to practice,'" she says. 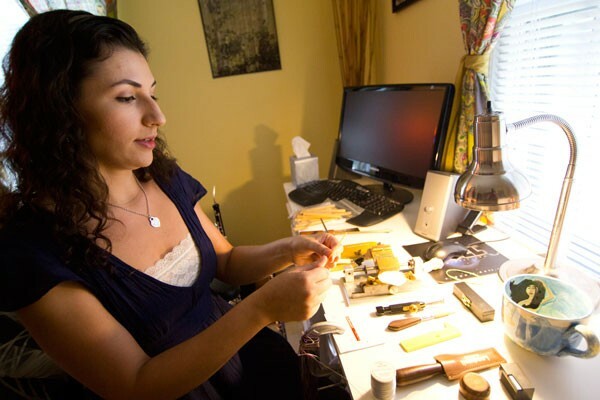 "I spend more time making reeds than I do actually practicing the instrument." It's obvious this space belongs to a dedicated musician. A large wooden trunk sits beneath a window, filled with sheets of music, and in the corner is a glimmering goldish music stand. Photos of teachers who have inspired her adorn the walls, and a sheet of paper with handwritten instructions on how to make a reed is tacked to a bulletin board. In the corner are large sticks of bamboo she bought from World Market. Given how much time she spends crafting reeds, it seems appropriate. It's not often that you'll find someone who's trying to de-modernize — unmodernize? Is there even a word for this? — a home. But actor/theater producer Donna Scott and her husband, Wes, are doing just that to the 2,300-square-foot ranch home they recently purchased. The house, built in 1956, is located in Madison Park, near Woodlawn Road and South Boulevard, the neighborhood where her husband grew up. More than the brick is from the '50s. "We're not purists. We're not trying to take it back to what it was, but just the general feel," Scott, 44, says. "We've always loved mid-century stuff." As a woman who leads a pretty chaotic life — at the time I visited, she was co-producing and rehearsing for the upcoming production Least Likely Friends at Theatre Charlotte, had just launched an Etsy business selling vintage goods ("Because I don't have anything else to do," she jokes), and was blogging for Metrolina ReStore — she finds the minimalism that characterizes '50s and '60s home décor pleasing. "It calms my brain down," she says. Her living room is spacious; a glass coffee table and shelf unit both disappear into its open area. The walls, donned in bright aqua blue, contrast nicely with the pale orange paint in the nearby dining area. 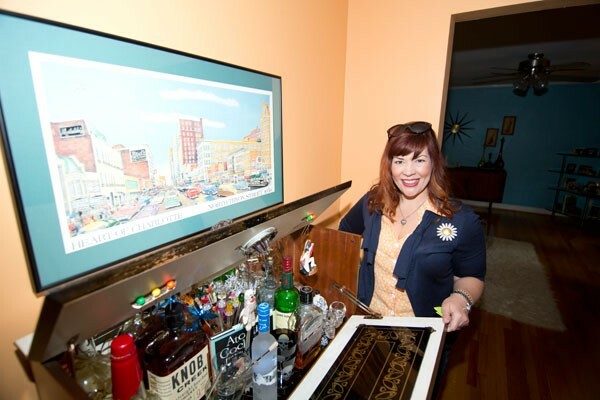 A '50s-esque English bar was one of her and her husband's first vintage finds together, and the chairs of her dining room set still have some of their original fabric. Scott admits she is fascinated with the year 1956 — she has collected a number of items from that year, including a Charlotte map with that timestamp, a set of books in the guest room and pieces of china and Pyrex in her cupboard. Despite that era being a time when women were often relegated to the roles of housewives and mothers, Scott champions feminism. One of her main goals in her theater work is to provide opportunities specifically for women, whether that be behind the curtain or on the stage. The first show she produced, The Body Chronicles, focused on women and body image. "My [love of mid-century décor] is very strange to me," she admits, "because I'm here to tell you that I would have never wanted to live in that time. I watch Mad Men, and I've talked to a lot of women who can't even watch that show, because it's so close to what they had to deal with." It isn't until Oneaka Mack, 40, demonstrates one of the African dance moves she teaches her students that she starts to open up in our interview. Originating from the Malinke of West Africa, the dance is called, fittingly, Sofa. She kicks her flip-flops off and gracefully swings her arms back and forth, crouching and moving stealthily across the patterned rug in her living room. She positions her arms like she's holding a spear. "Sofa is a hunter dance. A lot of the movements, you have to act as if you are actually hunting," she says. "I'm not a hunter. I've never shot a gun before. I've never thrown a spear. Maybe in my other lifetime I did all those things." In this lifetime, Mack is an IT business analyst by day and the artistic director of Oneaka Dance Company by night. "I'm analytical and scientific in nature but then creative when it comes to dance. So when I'm looking at how to do a certain movement, I analyze it or kind of break it down and then put it back together, and I think that helps me be able to teach it to other people." Her 1,500-square-foot Sharonbrook East home, near Eastway, is structured the same way. 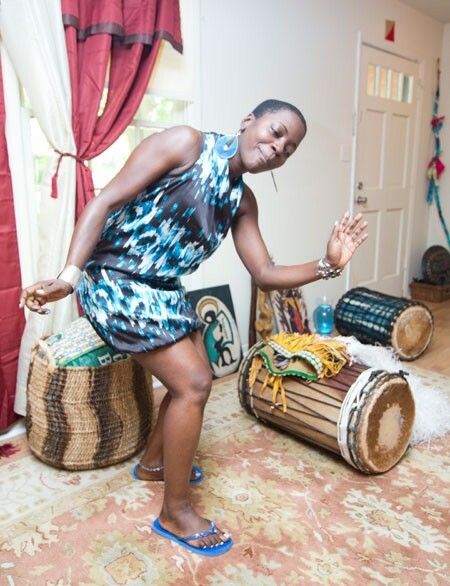 A lover of West African culture, her creative side is satiated by the tribal art and masks (including a bronze gazelle head) that adorn the walls and the handmade drums, from Ghana and the Ivory Coast, scattered around the floor. Visitors are invited to sit on the large, overstuffed red leather sofa; in fact, red accents are plentiful in this inviting space. "I just like the boldness of it. I remember growing up that we couldn't wear red nail polish or red lipstick or a red dress. It would be almost taboo," she says. For the analytical side of her psyche, Mack tells me that every item has a purposeful place. For example, the reddish tapestry that hangs behind the couch is actually a rug. She says that it just wasn't doing "what it's supposed to do" and so she hung it up on the wall for inspiration. Marrying her analytical and creative sides seems odd, but the lack of cohesiveness works for Mack. She says her home is contemporary and traditional. "That's how I see myself. It's urban, but it's also Victorian. And that's the way I see dance. It's not just one genre, one way. It's just based on how you express yourself, and you can express yourself in any way that you want." As I cross the threshold of Jimmy Lail's rental home in Windsor Park near Central and Eastway, I'm at first a little overwhelmed. Not only is a large (but friendly) dog greeting me by licking my exposed toes, but there's also so much stuff tacked to the living room walls to look at: concert posters, paintings by well-knowns like Kelly Keith and Robert Childers, handwritten notes and drawings, old photos. 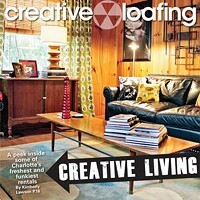 I even spot a torn-out page from an old issue of Creative Loafing. "Over time, [the wall décor] has turned into a no-rules approach," Lail says. "It's become a living art project. Pretty much you find something inspiring or funny or you just like it in any way, you put it up." The artful chaos seeps from the living room, through the kitchen and down to the basement, where Lail and his friends Jason Skipper, Chris Thomas and Jake Wade (together working as the production company/music collective Powerstance) make and produce music in their makeshift in-home studio. Currently, Lail, Wade and a third roommate, Edy Hinson, live in the house, but at one time or another, all members of Powerstance have called this home. Surrounded by random singer and band posters ranging from The Clash, Dr. Dre and Blink-182 to Black Sabbath, The Who and Freddie Mercury, Lail, Skipper, Thomas and Wade glean inspiration as they produce, rehearse and record songs for their respective bands: One Another, a three-piece maximum pop-rock band, is comprised of Skipper, Thomas and Wade. 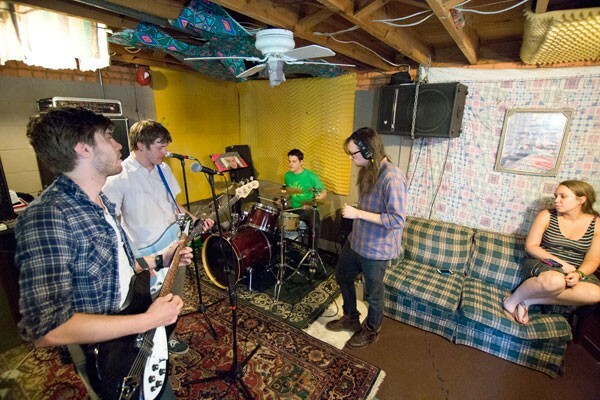 Lail and Skipper play in Hungry Girl, a two-piece rock 'n' roll band. And Skipper and Wade also play in an extreme metal band called Columns. It's confusing if you're not paying attention. The décor of the home is cluttered but functional — blankets hang on the basement walls to absorb sound, geometric patterned fabric has been torn into pieces to deflect the harsh lighting, and instruments are scattered throughout what they call the "fish bowl" — but for them, it works. "It's ours," Thomas says. 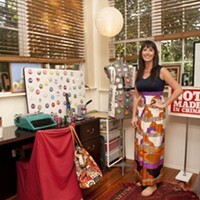 "It's our studio and we don't have to worry about time constraints. It's evolved into the centerpoint of all of our creative lives, in a way." 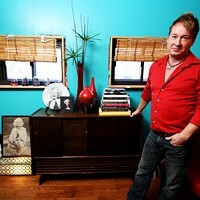 Forget a week; this guy has spent a lifetime with the iconic pin-up girl and has the collection to prove it.